A lot of media attention continues to be focused on the question of whether and how wolves trigger trophic cascades in ecosystems, by suppression of herbivory by ungulates and consequent release of vegetation and species such as birds that are dependent on the vegetation for their habitat needs. Trophic cascades can be caused by numeric effects (declines in ungulate populations), behavioral effects (prey foraging differently and avoiding areas of high predation risk), or a combination of the two. Behavioral or non-consumptive effects can be linked to numeric effects when altered behavior leads to poorer nutrition and lower pregnancy rates. This last effect has been proposed as a cause of elk declines in the Greater Yellowstone Ecosystem, but a new paper by Arthur Middleton and coauthors in Ecology Letters challenges that hypothesis, and finds that changes in elk behavior due to encounters with wolves have little effect on elk body fat or pregnancy rate, probably because elk encounter wolves infrequently (about every 9 days) in this area. This leaves open the possibility that wolves are contributing to elk population declines directly via predation. This last point has at times been missed by the media, resulting in headlines such as “wolves not to blame for elk decline”. Another paper by the same research team found that a factor contributing to elk population declines in Yellowstone National Park was the decline in native cutthroat trout in Yellowstone Lake after nonnative lake trout were introduced. 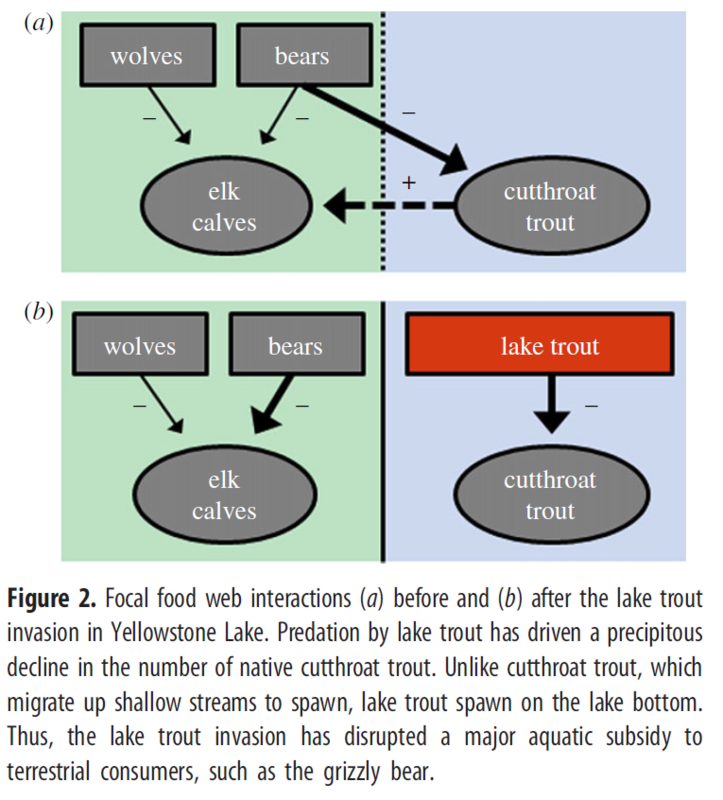 Because spawning cutthroat trout, but not lake trout, form an important food source for grizzly bears, the invasive speceis indirectly caused grizzly bears to shift their diet towards increased predation on elk calves, contributing to a decline in elk that had previously been attributed primarily to wolf predation (figure below). While most research of wolf-induced trophic cascades has taken place in Yellowstone, two new papers test the trophic cascade hypothesis in the northcentral US and Poland. Both take a correlative approach that compares vegetation in areas with vs. without wolves. In Wisconsin, Ramana Callan and coauthors found that species richness of both forbs and shrubs was significantly higher in areas with high wolf use. This supports the hypothesis that wolves, by reducing the intensity of browsing by white-tailed deer, are reversing the biotic impoverishment of understory plant communities caused by decades of overabundant deer populations. Similar contrasts between areas of high and low wolf use were found by DPJ Kuijper and coauthors in Poland, where browsing intensity of tree saplings was lower inside wolf core areas. At a finer scale within wolf core areas, sites with more coarse-woody debris, which is an impediment to escape from wolf predation, had even lower browsing rates, supporting the conclusion that at least a portion of the effects on vegetation are behaviorally-mediated rather than solely due to lower numbers of ungulates.